After so many years, few things chavistas throw our way make us do a double take. 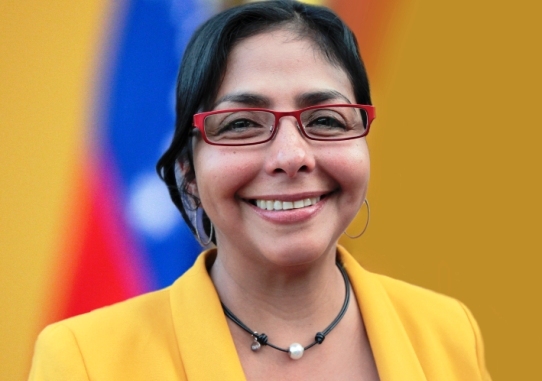 This one did: Delcy Rodríguez, Nicolás Maduro’s former minister of Communications, the über-chavista, radical sister of equally über-chavista mayor of Libertador (Caracas) Jorge Rodríguez, wants to be … a justice in the nation’s highest court! Never mind the fact that she is a blatantly partisan choice (surprisingly, our Constitution doesn’t say that justices have to be non-partisan). As far as I know, she is not qualified to be a justice. She’s a lawyer, and she got some graduate degree in France, but has she ever judged anything in her life? All her work has been in the public sector, defending the revolution from enemies near and wide. Here she is, calling people who protest in the streets “terrorists.” There she was, calling striking SIDOR workers “guarimberos.” People who disagree with the government are at the service “of the empire.” And with regards to free speech? Here she is, justifying the government’s censorship of news organization NTN24. All of Delcy Rodríguez’s public life has been one long justification for the wretched excesses of the Revolution. Very little of it has to do with the law, and all of it has to do with politics. This, come to think of it, makes her the perfect candidate for the TSJ. They might as well schedule her toga fitting soon.